Send top ups to your family and friends in El Salvador. Stay in touch with your relatives. Recharge cell phones balance in El Salvador. With Paga-Todo.com you can send Top Ups from $ 5.00 without leaving your home via the internet, it is safe, fast and easy to Top Up Tigo, Claro, movistar and Digicel in El Salvador. The best way to send top ups to El Salvador. Top Ups done instantly without delays or long waits. 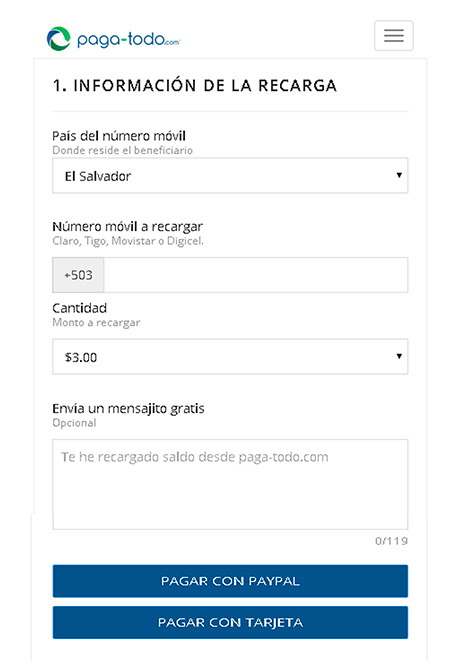 You can send a personalized text message (SMS) ABSOLUTELY FREE for your family or friends in El Salvador. Make your payment with your PayPal account or if you prefer with your Visa or MasterCard directly.